Electronics systems are behind 90% of today’s vehicle innovations. Industry advancements in autonomy, electrification and connectivity will only further increase the electronics content. As a result, our cars are becoming more complex, and it’s forcing automakers to change the way they are architected. Automotive engineers, software designers and car architects agree that the modern vehicle innovation process requires design experience and team collaboration to ensure that every car is safe, secure and runs flawlessly. For many university students and recent graduates, however, finding an opportunity to gain hands-on experience can be a challenge all on its own. Last week, I attended the NXP Cup finals in Germany. It was a great opportunity to gain perspectives from many of the university students and professors who coached them. 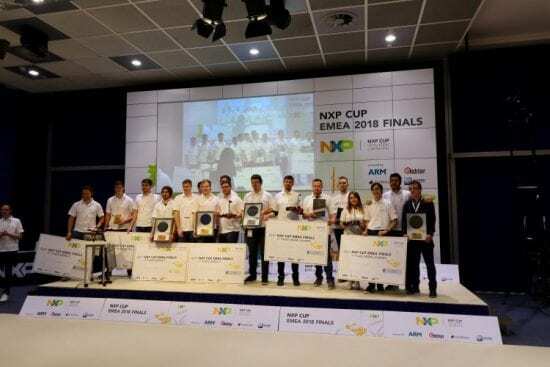 Overall, more than 110 student teams from as far as Morocco participated in the NXP Cup, which was sponsored by Arm, Elektor, MathWorks and Mouser. Months in advance of the competition, each team built an autonomous model car using the base components from NXP that you’d find in a modern vehicle, including controllers, sensors and motor drive electronics. They used industry-standard tools like MATLAB and Simulink to employ model-based design workflows. They learned hardware design and software coding, getting exposure to real-world concepts like driver replacement and connectivity. They rolled up their sleeves and coded, tested, debugged and deployed. And, like any carmaker, collaboration and team work were critical to their development. During each trial along the design path, they learned what it takes to build a reliable autonomous model car that was fast and stable – as a team. After the cars were built, rounds of competitions were held across Europe and North Africa. During each leg of the competition, the teams raced their cars for fastest time running on a track of curves, intersections, hills, bumpy roads and straights that simulated a real-world road experience –the fastest without derailing won. The races culminated at the final NXP Cup at Fraunhofer IIS Erlangen, which brought together 17 universities. Competition was separated into two groups. Some used the tried-and-tested Model C. Other teams used the new Alamak model, which is replacing the Model C. The Alamak features a powerful motor and a unibody chassis that allows more control. It has a new enhanced motor control board and a power board that offers preset inputs for encoders, multiple cameras and wireless Bluetooth. The new motor control board has been developed with full integration features, allowing it to be mounted directly with the power board and the Freedom board. Regardless of the model used, both tracks of competitors learned how to assemble and program their cars to run the track – skills that would have been difficult to master in a textbook-only classroom! The race to innovate safe, efficient cars starts with an understanding of how technology works, and that’s what the NXP Cup offers students. Furthermore, future engineers learn in a collaborative environment, gaining necessary skills that will help them in their careers long after they’ve graduated from university. Congratulations to all of the participating teams!